Can you identify the name of the instrument used? an apparatus used in aircraft for measuring altitudes. is used for to measure intensity of sound. is an instrument for measuring the force and velocity of wind. an instrument to measure intensity of sound. is an instrument required for improving imperfect sense of hearing. for continuous recording of atmospheric pressure. is an apparatus used for measuring the atmospheric pressure. is an instrument used for seeing distant objects, the rays of light are twice reflected by means of right- angled prisms. a compass with legs for measuring the inside or outside diameter of bodies. is an apparatus for charging air with petrol vapours in an internal combustion engine. a medical instrument used for tracing the movements of the heart. is a medical instrument for tracing heart movements. is an instrument kept on board the ships for measuring accurate time. It consists of a series of lenses arranged to throw on a screen an enlarged image of photographs. The lens system which forms the image on the screen is termed the focusing lens. split ring which forms the main part of a D.C. Dynamo. needle: for knowing approximately the North-South direction at a place. is an instrument for use in recording growth of plants; invented by J.C. Bose. It is an instrument used to determine the angle between the direction of the resultant intensity of earth’s field and the horizontal component at a place. This particular angle is know as the dip of that place. to help breathing in infantile paralysis. The origin of electricity in a Dynamo is the transformation of mechanical energy into electrical energy. It depends on the principle of electro-magnetic induction whereby a current is produced on traversing a magnetic field. (EEG): It is the technique of recording and interpreting the electrical activity of the brain. Records of the electrical activity of the brain, commonly known as “brain waves”, are called electroencephalograms or electroencephalographs. EEG is the common abbreviation for both the technique and the records. for projecting films as well as images of opaque articles on a screen. It is a glass tube for measuring volume changes in chemical reactions between gases. is an instrument used for measuring depth of the ocean. an instrument for measuring currents of small magnitude. This special device is used for detecting the presence of radiation and counting certain atomic particles. an instrument with which we can reproduce the sound recorded by a suitable recording apparatus. It is fitted with a special type of apparatus known as sound box invented by Berliner. is an instrument for recording measurement under water and to determine the presence of oil deposits under water. is an instrument used to illustrate dynamics of rotating bodies. It is a type of spinning wheel fixed to the axle. is an instrument used for measuring the specific gravity of liquids. is an instrument used for recording sound under water. is an instrument used for measuring humidity in air. is an instrument used to record graphically various physiological movements i.e., blood pressure, heart beating, study of lungs etc in living beings. is an apparatus used for measuring the purity of milk. for determining the pressure of a gas. is an apparatus which is used to guide the sailors. The needle always points north-south. is an instrument used for converting sound i.e., fraction of the lowest division of a given scale. is an instrument used for converting sound waves into electrical vibrations. is an instrument which is used for magnifying minute objects by a lens system. is used for cutting an object into thin parts for microscopic inspection. is an instrument by virtue of which the distance covered by wheeled vehicles is recorded. It is usually used by the crew of a submarine to survey the ships etc, on the surface of the sea while the submarine is under water. It also enables the sailors to observe objects on the other side of an obstacle without exposing themselves. is an instrument used for reproducing sound. is an apparatus used to compare the illuminating power of two sources of light. It is a glass tube with the aid of which a definite volume of liquid may be transferred. is used for comparing the e.m.f.s, of cells, measurements of the thermal e.m.f.s, large potential differences and currents. It is also used for measuring low resistances. is an instrument for measurement of the humidity of the atmosphere. is an instrument for recording high temperatures from a great distance (i.e., for recording temperature of the sun etc.) by making use of the laws of radiation. Radio, Angle, Detection And Range is used to detect the direction and range of an approaching aeroplane by means of radio microwaves. Gauge: is an apparatus for recording of rainfall at a particular place. is an instrument for measuring the emission of radiant energy. is an instrument to measure refractive indices. is an instrument for determining the amount of sugar in a solution. It is used in breweries. is an instrument used for recording earthquake shocks. is an instrument invented by John Hadley used for measuring the altitude of the sun and of other inaccessible heavenly bodies. It is a type of spectroscope suitable for the precise measurements of refractive indices. (2) An instrument for measuring the energy distribution of a particular type of radiation. is an instrument which indicates speed at which a vehicle is moving. is an instrument for measuring curvature of surfaces. an instrument used for measuring arterial blood-pressure. an instrument, with the help of which a pulse beat makes a sound. an instrument, by virtue of which, arterial pulsations become visible. It is a special type of binocular, through which a double photograph snapped from two different angles by a two-lensed camera is viewed in solid relief. is an instrument to hear and analyse movements of heart and lungs. for recording small intervals of time in the laboratory, in races and other events. is an instrument for viewing objects moving rapidly with a periodic motion and to see them as if they were at rest. 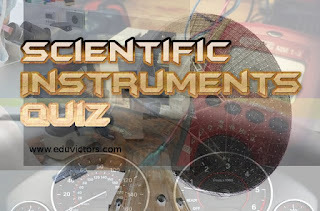 is an instrument for determining speeds of aeroplanes and motor boats. a device by virtue of which two persons at two different places can communicate. It consists of two main parts (i) a microphone and (ii) a receiver. an instrument which prints automatically messages sent from one place to another, on telegraph lines. is an apparatus used for observing distant objects. is an instrument for measuring horizontal and vertical angles. an instrument based on thermo-electricity used for measuring temperatures. is an apparatus used for measuring temperature. It is an instrument used to regulate the temperature to a particular degree. 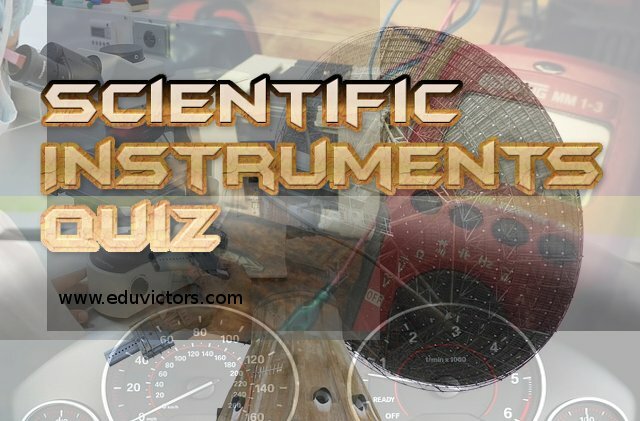 is an instrument to measure viscosity.